AS IT HAPPENED: India dominate again to leave victory at Trent Bridge all but assured. Another horror show for England's batsmen as tourists make early inroads in Nottingham. India came into the Test 2-0 down, knowing they had to avoid another defeat to keep the series alive. 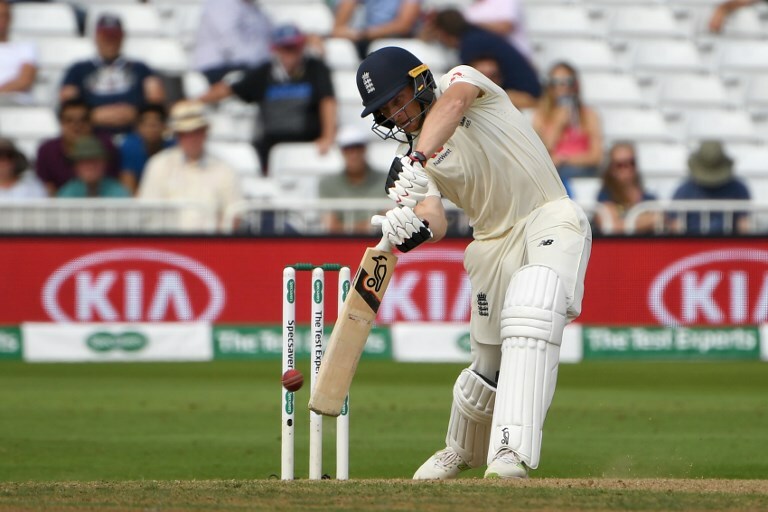 After their abject display at Lord’s last week, few gave them a chance, but at Trent Bridge they dominated from the start and tomorrow are all but assured of a vital victory. They needed six wickets in the final session for for the win, but only took five, meaning they have to come back on Wednesday to complete the job. 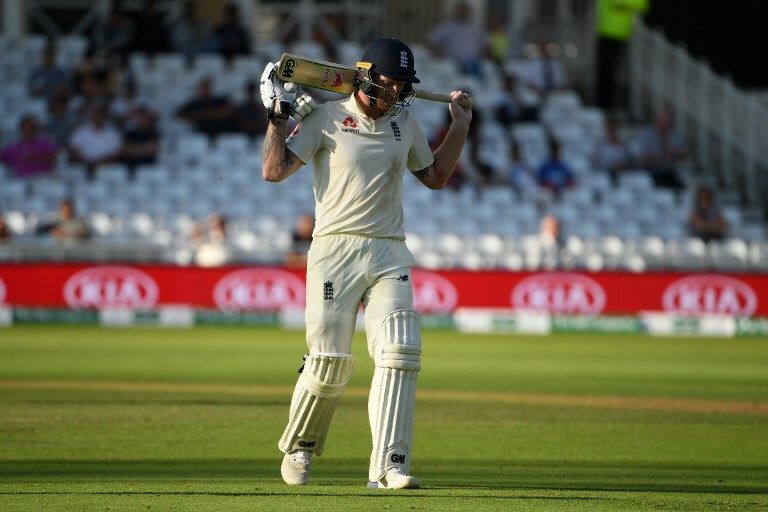 The evening session started off in much the same way as the afternoon session had finished — with Buttler and Stokes looking at ease at the crease and untroubled by anything the India attack threw at them. Jos Buttler batted brilliantly for his first Test ton, which held up the India victory charge. The pitch looked far from the minefield it had seemed when England were bowled out for 161 in the first innings and when they lost four quick wickets in the morning. Buttler (106) in particular looked assured and it was no surprise when he reached his maiden Test century. It was Test batting at its finest, full of poise with England on the ropes. But as soon as his wicket fell, LBW to Bumrah (five for 85) there was a sense that more would follow. 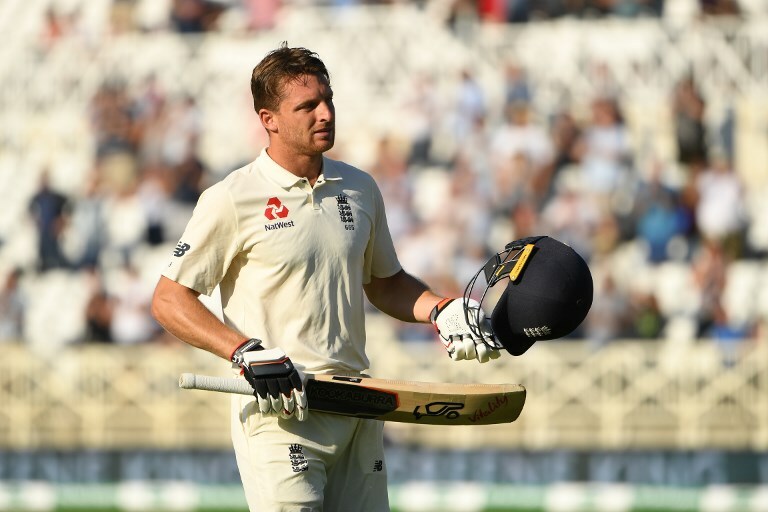 If there is one constant about this England side it is that when one wicket falls more will come soon after, and once again Root’s side did not disappoint. Hardik Pandya celebrates taking the wicket of Ben Stokes. From 251 for four the hosts slipped to 241 for eight as India took their chances after a wicketless few hours. Jonny Bairstow went first ball for nought, clean-bowled Bumrah, Chris Woakes (four) followed soon after for four, caught behind off the same bowler — a wicked bouncer catching the all-rounder by surprise. And then Stokes (62), who had looked as assured as Buttler, was caught behind off Hardik Pandya (one for 22). For the tourists the new ball and brilliant bowling had done the trick. They had remained patient all afternoon and got their rewards late on in the day. There was some late resistance from Stuart Broad (20) and Adil Rashid (30 not out) but, with the sun setting, Bumrah sent pace ace Broad back to the pavilion. The tourists were not able to pick up the last wicket needed, but there is little doubt they will do so early on Wednesday morning to breath life into what is turning out to be an entertaining series. 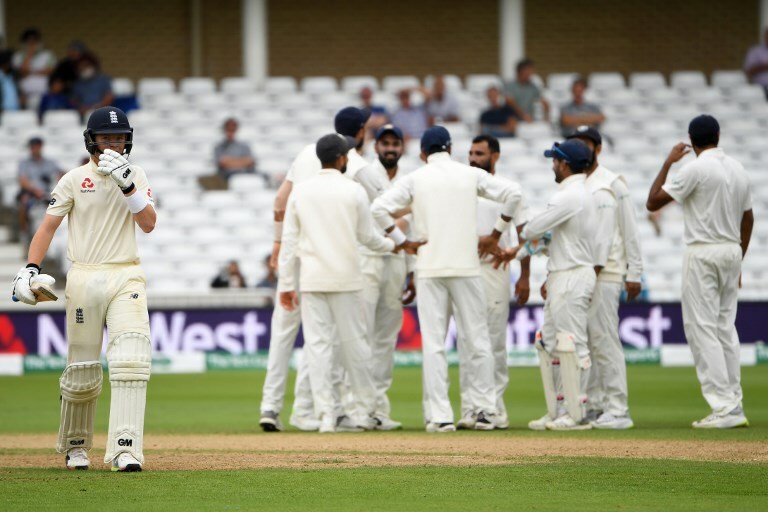 The result will not only keep the contest alive — England will lead 2-1 with two matches to play — but now brings into focus the hosts batting, a role reversal of the Lord’s Test after which India’s batters were widely criticised. Not only that but after this dominant victory the tourists will be only too keen to get at Joe Root and Co. once again and will doubtless back themselves for victory in the fourth clash at Southampton starting next week. A dejected Ben Stokes walks off the pitch after scored 62 at Trent Bridge. AFTERNOON SESSION: England 173-4 & 161, India 329 & 352-7 dec: At last, some good news if you are an England fan, your team has won a session. 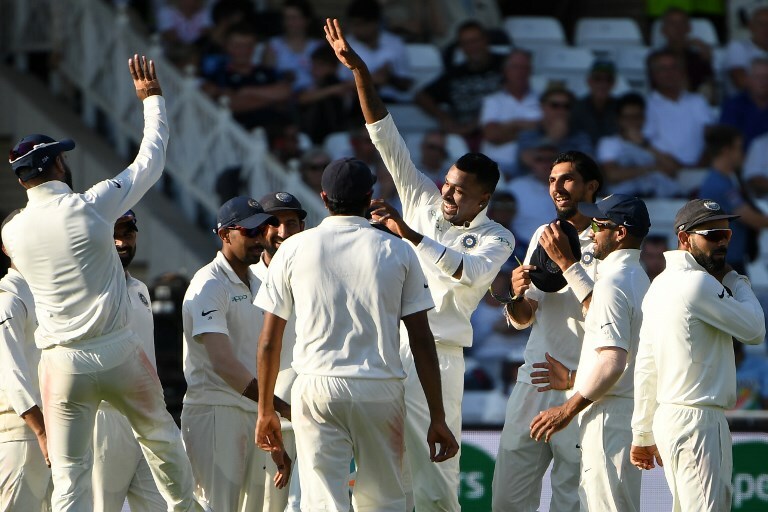 Having seen four wickets fall quickly during the morning’s play the host knew they had to at least show some backbone and take the fight to India. They did this with some style, Jos Buttler (67 not out) and Ben Stokes (42 not out) playing with an ease and simplicity that seemed beyond their teammates this morning. Having lost all 10 wickets in the afternoon session on Sunday England lost none in the same period just two days later. Prior to today Stokes and Buttler have had 11 partnerships in Test cricket and averaged just 15.9. This is their first hundred partnership and came in 195 balls. Jos Buttler looked in fine touch out in the middle and frustrated the India attack. For India it was very much a case of from feast to famine. Virat Kohli and Co. will not be worrying though, they still have four sessions to get the six wickets they need for victory. England went into tea on 173 for four and doubtless hoping for more of the same once back in the middle. MORNING SESSION: England 84-4 & 161, India 329 & 352-7 dec: Chasing 521 England always knew victory was highly unlikely, this session, this day in fact was all about being positive. Positivity in defense, positivity in decision making, basically the exact opposite of what transpired over the first two hours at Trent Bridge. Having lost all 10 wickets in a single session on Sunday it was perhaps understandable that there were a few moments of indecision out in the middle. But whether that should have resulted in four wickets falling is another matter. Keaton Jennings was the first to go. The left-hander played and missed several times on Monday evening and early on today India finally had their man — someone who with every innings looks more and more like a walking wicket — when he edged behind of the bowling of Ishant Sharma for 13. That left the hosts on 27 for one. As sure as night follows day, the next wicket fell soon after. Alastair Cook is currently in one of his ever more-regular lulls in terms of run scoring. The former England skipper fell the same way as Jennings, caught behind off Ishant (two for 24) for 17. He has only one score of over 50 this year and the knives may well be out for him once this Test is over. At the crease England had Joe Root and Ollie Pope — the present and the future of the side’s Test team runs. The pair fought well and hard, but never looked comfortable with the India attack, brilliantly led by Ishant, probing their techniques ball after ball. Ollie Pope trudges off after a horror shot gifted India their fourth wicket of the morning. The order of the day would have been to hold out until lunch, but Jasprit Bumrah (one for 26) got Root (13) to prod at one outside his off-stump to be caught by KL Rahul in the slips. 62 for three soon became 62 for four as first ball of the next over Pope (16) tried to lay into a wide swinging delivery from Mohammed Shami (one for 28) only to edge to Virat Kohli at second slip. It was just what England wanted to avoid and the dream session for the tourists. It could have been worse, though, with Jos Buttler dropped on one. But there is little doubt that that will only extend England’s misery in the middle, and not effect the inevitable India victory.